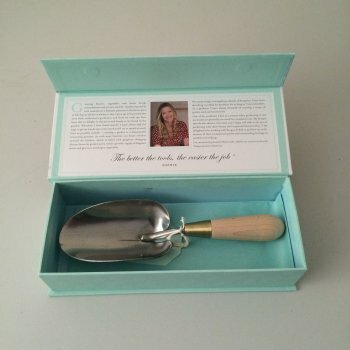 This garden trowel has been designed by Sophie Conran and comes in a lovely gift box. The handle of the trowel is made from natural waxed beechwood while the head of the trowel is constructed from mirror polished stainless steel helping it glide smoothly through the soil whilst keeping rust at bay. The joint between the head and handle of the trowel is a solid brass ferrule ensuring a secure joint. The trowel has been ergonomically designed and over time the handle will slowly mould itself to the shape of your hand.